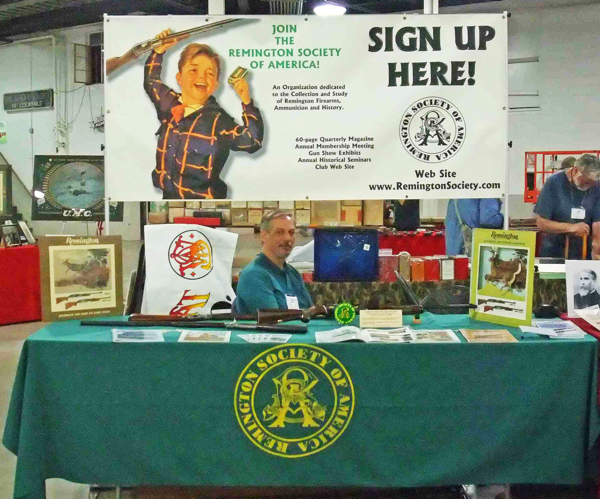 On October 10th & 11th, RSA Director Gene Myszkowski (assisted by RSA member Peter Polansky) manned the RSA table at the 14th Annual NRA National Gun Collectors Show held at the Big “E” in West Springfield, MA. They had a steady stream of visitors each day, as Peter exhibited his nickel plated Remington No. 2 Rolling Block and Remington No. 7 Rolling Block in cal. .25-10 along with Gene’s Remington Model 760 “F” grade on the RSA table. Both rolling blocks and the M760 generated interest all day long. Gene had a separate exhibit table featuring James P. Lee’s Hammer Operated Springfield Lee Model 1875 Rifle of which only 143 were made at the Springfield Armory in 1875, at a cost of $10,000. 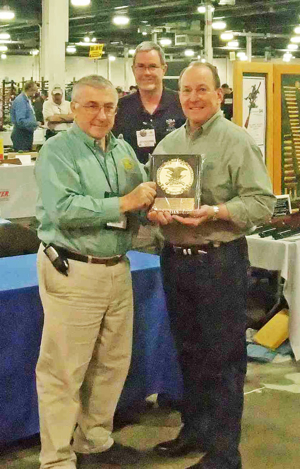 Gene’s exhibit won an Outstanding Display Award from the Winchester Arms Collectors Association and the Outstanding Exhibit Award – Antique Arms from the NRA. Gene’s Model 1875 Springfield Lee does have a connection with Remington as the Lee #61 Model ( predecessor to the Model 1875) that was demonstrated before the 1873 Army Ordnance Board was made in Ilion. James Lee was hired by E. Remington & Sons at a salary of $3,000 per year in 1875. Gene receiving the award from NRA’s new President (with long-time friend Jim Supica – NRA Museum Director – in the background).